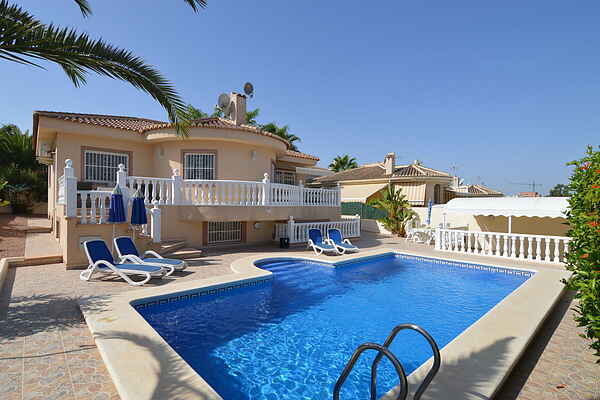 Fabulous villa in the Benimar district of Benijofar on the Spanish Costa Blanca with a private swimming pool and its own garden. The large villa has no fewer than three bathrooms and two kitchens and accommodates up to ten people. The villa is divided into 2 accommodation units, making it ideal for two families holidaying together for example. With an American fridge, dishwasher, microwave, washing machine, oven, satellite television, DVD player and internet access, the property is equipped with every convenience. There is air-conditioning in the upstairs lounge, the upstairs main bedroom and the lounge on the ground floor. And there is a central heating system in the whole house whichs makes it ideal for winter stays. There is a choice of terraces, restaurants and shops within walking distance. For the little ones, there is an aqua park in Quesada, for older youngsters there are various discotheques in Rojales, Guradamar del Segura and Torrevieja. The small towns of Formentera, Catral, Dolores and Elche are all in the vicinity. Benijofar borders Rojales and is one of the smallest communities in the region. This little village owes both its prosperity and misfortune to the river Segura which in 1957 burst its banks and destroyed the village. The village was rebuilt and the river was channelled to bring it under control. Smoking is not permitted in this property.